When is a Labrador Retriever a “Pit Bull”? We were contacted this week by one of our readers in response to the article “Persecution Ontario Style.” She was offering support in light of a very similar incident that happened last year to her mother, who wishes to remain anonymous. The reader’s mother lives in Thornhill, Ontario, Canada. Thornhill is a well-to-do area just north of Toronto where the houses are large and well-kept and the residents tend to be educated and successful. On a hot summer day in July 2006, out of the blue the doorbell rang. The 64-year-old woman opened the door to find an Animal Control Officer (ACO) standing there. As it was such a hot day, she invited the officer into the house where it was cooler. He asked if he could see her dog. The woman obliged, assuming they were following up on the licensing program in Thornhill. “Lucky,” a five-year-old Labrador Retriever, was licensed with the city. The woman went into the backyard and brought Lucky, who was wearing her collar and license tag, into the house to meet the ACO. The officer began to take many pictures of Lucky. He didn't ask Lucky's breed, age or anything else about her. After he had taken the photos, he pulled out some papers that explained DOLA (Dog Owners Liability Act) and the amendments that ban American Pit Bull Terriers, Staffordshire Bull Terriers, American Staffordshire Terriers and any dogs that are substantially similar to those breeds. He then informed the woman that he was taking Lucky with him to be destroyed. The shocked and horrified dog owner didn’t understand what was happening. She started to cry for fear of what would happen to her dog. To have an ACO arrive at your house unexpectedly and to invite them in on a hot day and then hear them say that they are taking your dog for destruction is almost incomprehensible. At this point, the woman’s husband came into the room. He promptly escorted the officer off the property and told him not to come back unless he had a warrant and court order for the destruction of their dog. One month later, two police officers showed up at this couple’s door and charged them under DOLA with owning a prohibited dog. 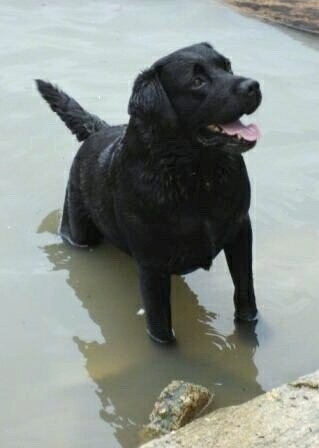 Lucky is a five-year-old black, purebred, registered Labrador Retriever. The couple took the registration papers to their set court date which proved their dog is not banned in the province of Ontario. The charges were dismissed. Imagine what would have happened had Lucky not been a registered purebred dog. How many dogs in the province are unregistered? How many are mixed breed dogs that CANNOT be registered? There is NO proof of your dog’s breed without registration papers. The Canadian Kennel Club estimates that only 10% of Ontario dogs are purebred and registered. That means that 90% of all dogs in Ontario cannot have their lineage proved. That means that 90% of all dogs in Ontario, when found in this situation could lose their lives if they are not Lucky! The couple feels this whole situation may have started over a neighbor dispute over how to cut the hedge bordering on both properties. They have no proof because Animal Control won't release the names of complainants, but can’t think of any other reason why that ACO came knocking on their door on that nightmarish day. Between the time of the visit and subsequent charges being laid and the court appearance the woman had a heart attack and was diagnosed with stomach ulcers. Her doctor attributed both to stress. We hope she is well on her way to recovery! It is sickening to think about what this Ontario Liberal Government has done to responsible citizens of this province. It is now a crime to own somebody's idea of the wrong shape of dog in Ontario. It makes us very angry to know that responsible dog owners in the Province of Ontario were legislated into second-class status and had their constitutional rights stripped because of grandstanding and government irresponsibility!! Lucky was named as such because the woman felt she was “lucky” her husband agreed to let her get a dog.